I had mentioned I married a sadist, yes? All she wanted to do was climb to the top of that thing. 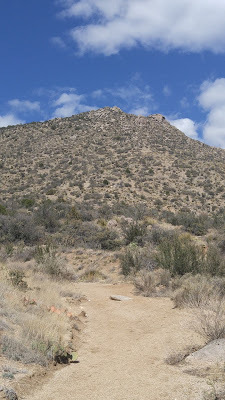 Up the Embudo Trail, a mere 1.5 miles each way, to the Embudo Springs and back. Only 2,000 feet of elevation change over sandy terrain, certain to be filled with coyotes and rattlesnakes. What could go wrong? 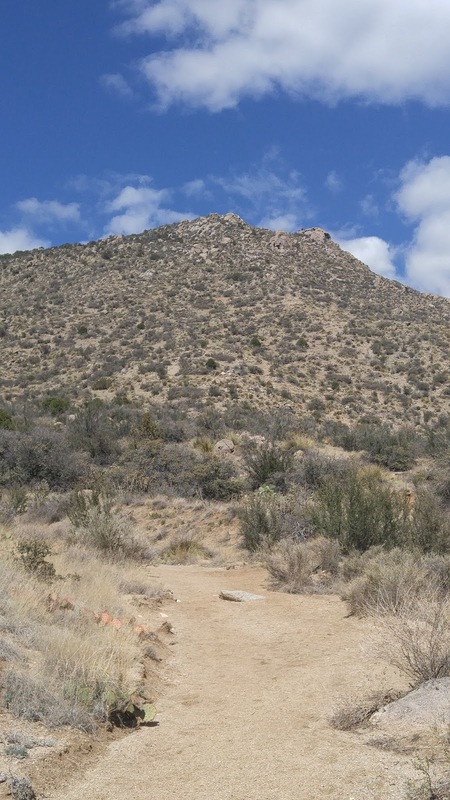 I shouldn’t have worried about the coyotes and the snakes – they sat along the sides of the trail and laughed as I passed by, huffing and puffing all the way. Ten minutes in I felt like I had been walking for days – thighs quivering, calves burning, ready to lay down and quit, and maybe die while I was at it. I have religiously walked our dog every day around our neighborhood for months, refusing to reduce my mobility anymore, so I thought I could deal with a little hike up into the mountains. Let me tell you – it is a whole different thing walking uphill through sand than it is walking on pavement through a mostly level neighborhood. Didn’t know they had whales in the desert. From now on, all I have to do when I don’t want to exercise is look at this picture. I may make it the background on my phone. I look truly, truly hideous. My earlier article, filled with platitudes about how feeling good is more important than looking good? Still valid, but looking this bad makes me feel bad. I want to ask “What happened to me?”, but I know damn well what happened to me. Take 10 years of Shiner Bock, add 1 year of Depakote, then layer on 12 years of fear that exercise will cause seizures. Stir briskly, drink it down, and you, too, can look like this! Please note – we completely missed the trail. We’ll do better next time. 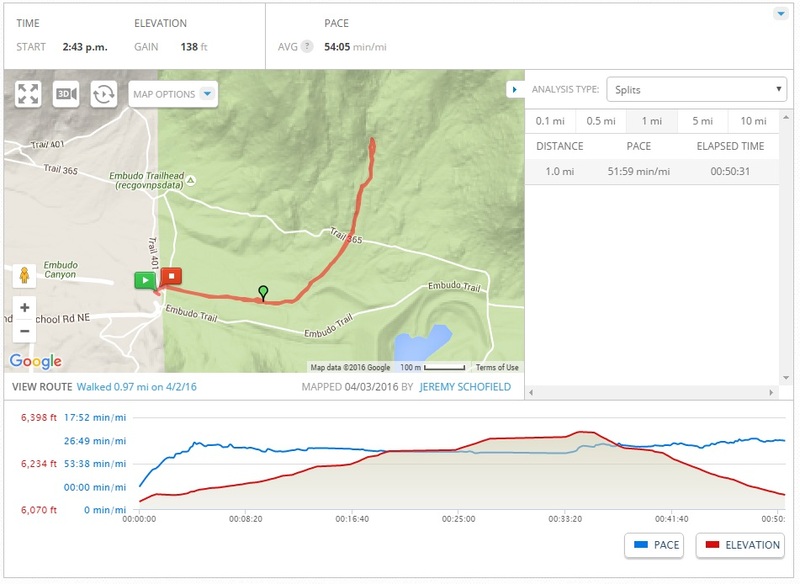 1 mile, straight up and straight down, in 52 minutes. I can’t remember the last time I walked a mile in the mountains. I can’t remember the last time I exercised for 52 minutes. 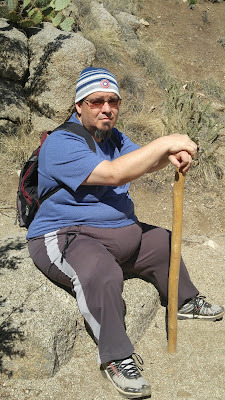 Maybe there is something to this outdoor hiking thing after all. I just have to tell myself I will do better next time. Oh, yes – there will be a next time. The background photo on my phone tells me so.